Mycotoxins are fungal secondary metabolites frequently affecting agronomical crops and consequently imposing a major challenge for food safety and public health. In this study, a total of 67 raw cereals (55 maize and 12 sorghum) were collected from the market of Togo. The samples were investigated on the occurrence of 21 mycotoxins using state-of-the-art high-performance liquid chromatography coupled to tandem mass spectrometry (HPLC-MS/MS). The most frequent occurring mycotoxins were fumonisins (88 and 67% for maize and sorghum respectively) with concentrations ranging from 101 to 1838 μg/kg for maize and 81.5 to 361 μg/kg for sorghum, respectively. Aflatoxin B1 was detected in 38% of the maize samples with maximum contamination levels of 256 μg/kg, and 25% of the sorghum samples (range 6–16 μg/kg). The concentrations of aflatoxins were high in maize, with some cases exceeding the maximum legislative limits (EU) for unprocessed maize placed on the market. 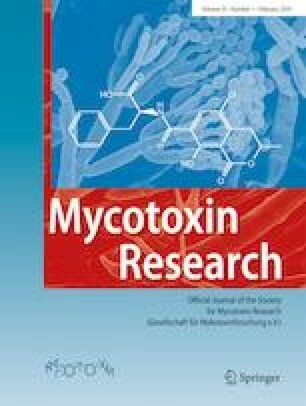 In addition to these high contamination levels, the co-occurrence of three classes of mycotoxins (i.e., aflatoxins, fumonisins, and trichothecenes) was observed in this study. 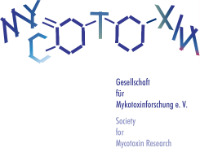 For the first time, the multi-mycotoxins occurrence in agronomical crops in Togo was reported. This research was funded by West African Agricultural Productivity Program (WAAPP) and MYTOX-SOUTH. The authors wish to express gratitude to these organizations for the financial support.